I am enjoying the time between semesters, having my daughter at home, and just doing a lot of not much. Unfortunately, I have a pile of marking that I have made very little progress on, and with every passing hour that monkey on my back gets bigger and bigger. (It started off as a spider monkey when term had just ended, but if I don't get cracking soon that pile of marking is going to become a full-blown gorilla!) But here's what I really want to show you! I have managed to get a bit of sewing done, and I want to show you my latest project because it's something I'm very proud of. This block is called Chinese Gongs. 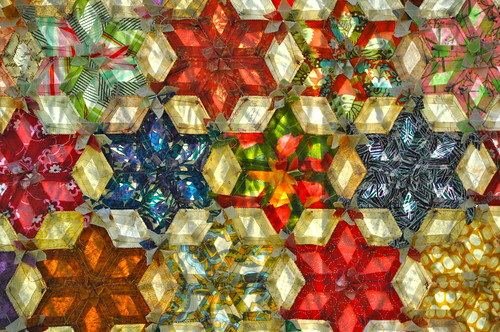 I found a drawing of it on the internet here, where it appears gridded but with no other dimensions or instructions. 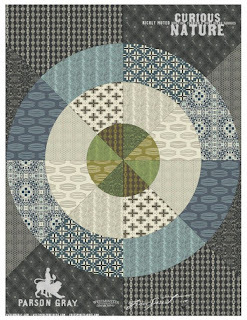 So this was my first attempt at drafting a quilting block that had any degree of difficulty at all. And to be truthful, it wasn't very difficult at all - the hardest part was finding a compass that would expand beyond six inches. 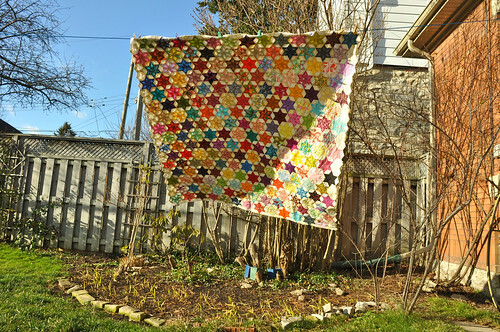 I think it's a stunning block - I think it would make a spectacular two-colour quilt. 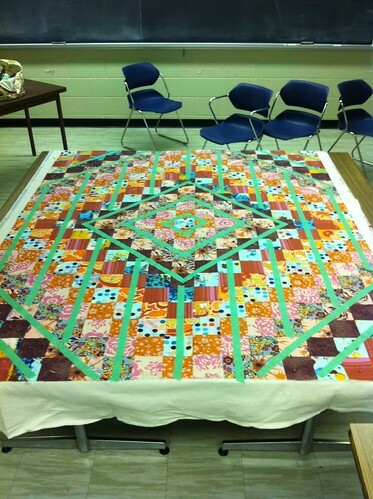 The block is 14" square, and the finished quilt will be a 5 x 5 layout, finishing at 70" x 70". 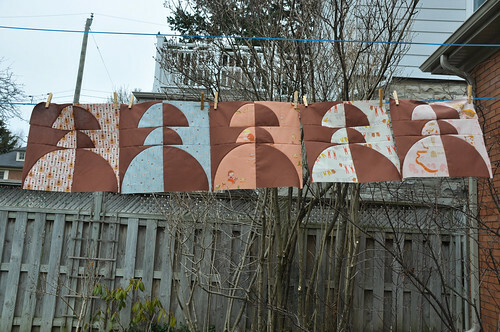 I cut a set of templates that allowed me to mark the curves on the fabric. 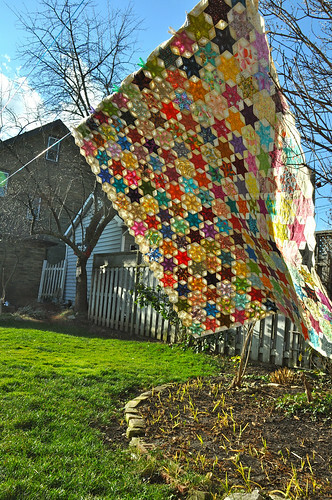 Directional fabric means that you can't really get more than one block per FQ and there is a fair amount of waste as a result. (I should say scrap rather than waste.) 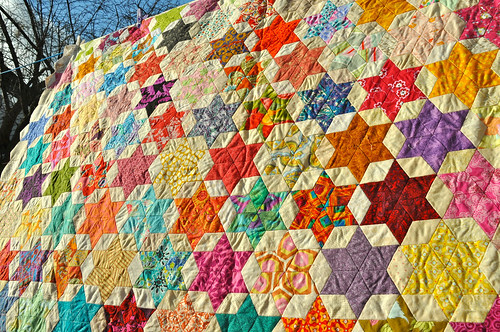 One option is to draft it down a bit smaller so that one could get two blocks per FQ, but that would make for awkward size measurements. 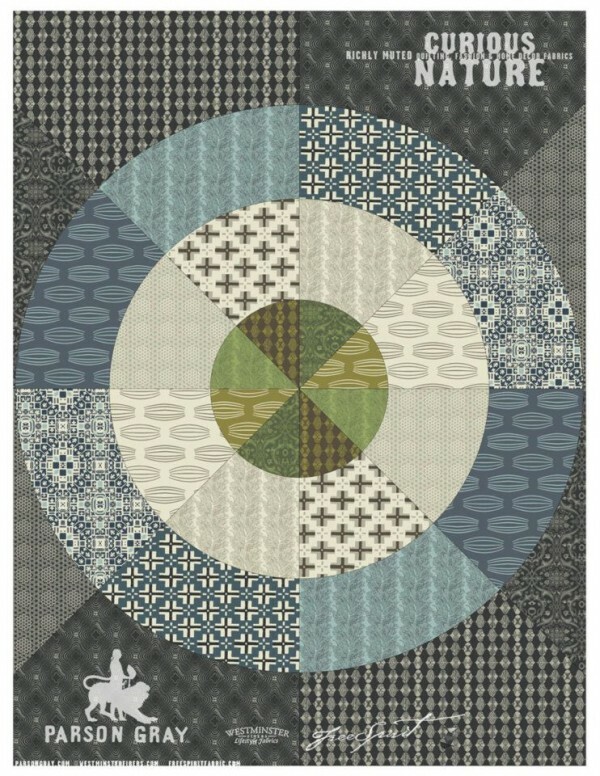 The current block is based on a 14 x 14 one-inch grid. It is the most tedious thing in the world to trace the templates and cut out each one - six per block - so I am cutting and piecing five blocks per sitting. 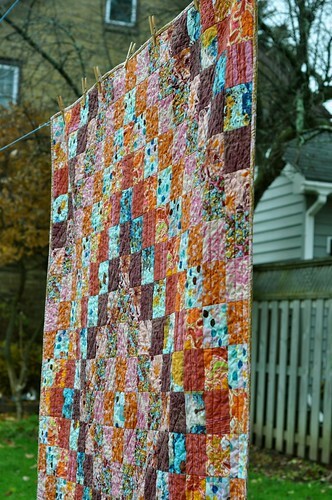 For this one I am proud to say that I have shopped entirely from stash. 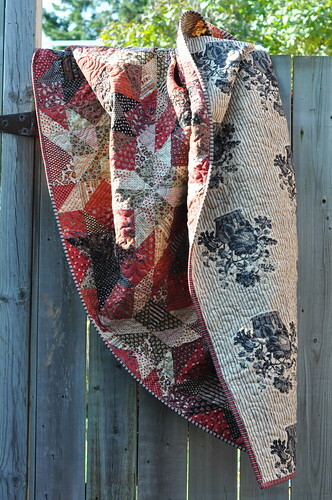 I am using the FQ set of Heather Ross' Far Far Away III that I bought way back when, and I had a four-yard length of this Kona cotton brown that I wanted to use up. 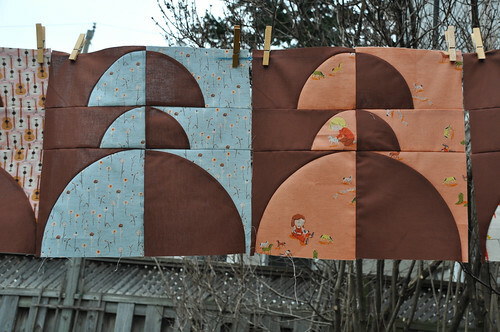 This is not my typical colour scheme, but I think the brown goes nicely with all the prints in the set, and it provides the contrast to make this block work. Alas, the weather is making these blocks look pretty pale and washed out. They aren't nearly so insipid in real life! 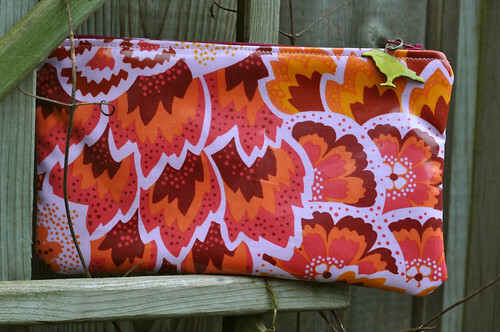 I have also made, over the past six weeks or so, a fleet of little zipper bags. 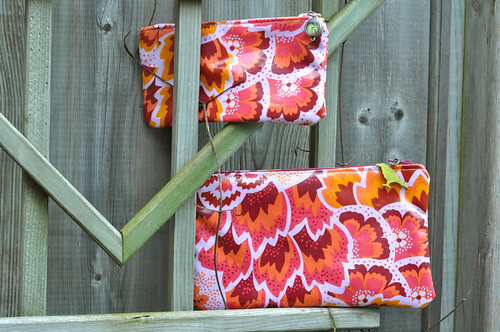 I bought Oh Fransson's pattern for zipper pouches and just went to town on them. Her instructions are very clear and thorough, a pleasure to use. I gave some of them away to my TAs at the end of the term and a couple to my daughter, one to my secretary, etc. Somehow they found homes before I got my camera out. But I did manage to snap a photo of these two. 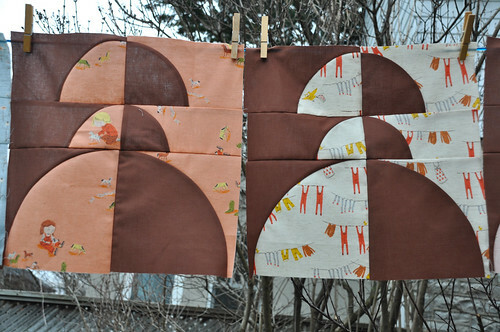 I made them out of Amy Butler laminated cotton. It was my first time using this material and I was a bit apprehensive but everything went fine. I employed Pink Chalk's tip about using a glue stick to hold the zipper instead of pins or (my usual) basting, since these methods will put holes in the fabric. I found some cute zipper pulls at Michaels. 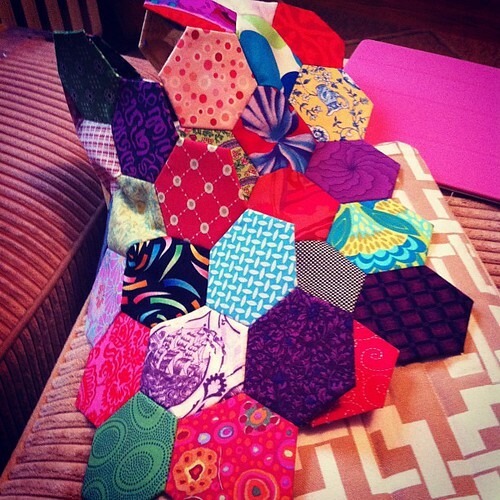 As the year draws to a close, I'm been thinking about my personal quilting goals for next year. I've been reading posts about similar topics, and I find a lot of inspiration in the goals that people set for themselves. That will be a topic for my next post! Signing off for now - I hope you are all still enjoying some relaxation and family time, like I am! 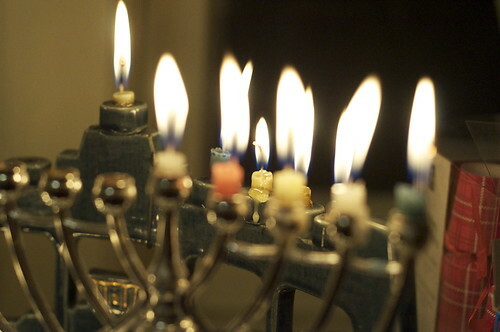 Tonight is the first night of Chanukah (don't get confused by this photo which was taken last year on the fourth night)! 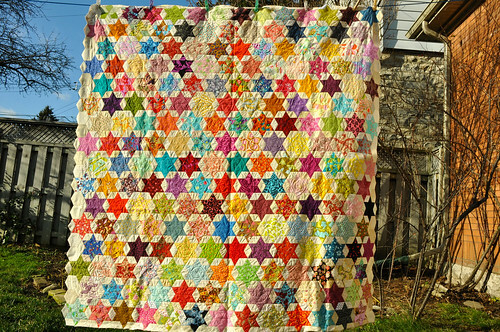 Wishing the few Jewish quilters out there Chag Sameach! Enjoy your latkes and sour cream (down with applesauce)! 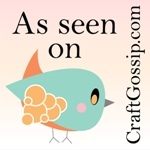 Wow - this past week was a crazy week on the old blog - many, many visitors and commenters! I had a blast reading the comments and also checking out the many participating blogs. I found a boatload of new blogs to follow, and I'm very, very happy indeed to welcome the new followers to my blog. I hope you will enjoy visiting me here! 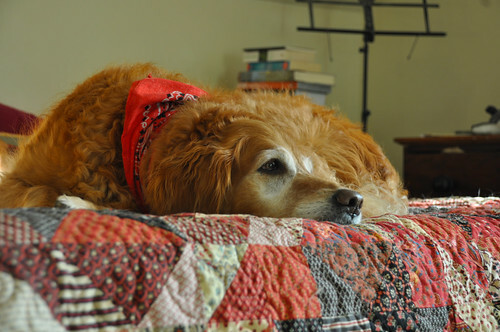 Frankly, something deep inside me rebels at giving a prize to an avowed dog-despiser, but I will just believe that Deanna hasn't yet met the bundle of furry joy that turns her heart to mush. Deanna, I'll be emailing you shortly and asking for your details! Currently, I'm just as happy as can be that my daughter is home from university. I never thought I'd say how great it is to see all her make-myself-beautiful crap strewn all over the bathroom counter. I'm looking forward to some wonderful time hanging out with her and doing nothing much. I sure did miss her this term! 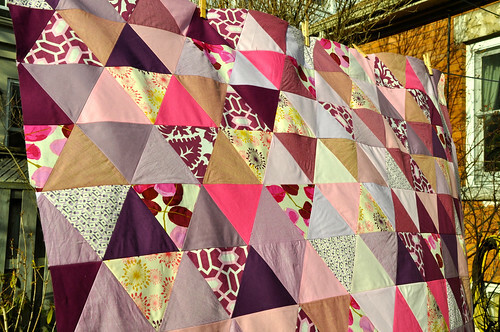 Finally, no blog post is complete without a quilt-related photo, so here is mine; it's the new hand-sewing project I've started. Thank goodness Sew Mama Sew changed their participation policy so that you didn't have to sign up in advance - otherwise I would not have been able to play along! 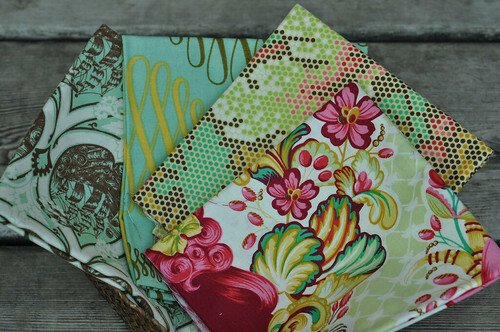 Yes, today is Sew Mama Sew giveaway day! 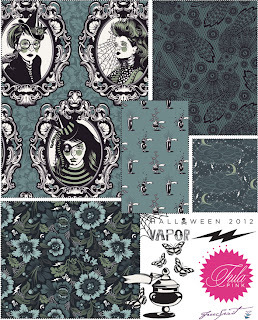 The swag I am offering is below: four fat quarters of Tula Pink's Parisville. And bonus: since I bought these at a Canadian LQS, they are meter FQs instead of yard FQs, which means you get an extra inch and a half (and what girl doesn't want an extra inch and half?)!! HOW TO ENTER: The last time I had a giveaway, we played the Person Below Me game in the comment thread and it was great fun, so we'll do it again. Here's how it works: I'm going to leave the first comment with a statement that begins "The Person Below Me ......" , and the second commenter will answer True or False to my statement, and then leave their own "The Person Below Me" statement. The third commenter will answer True or False and then leave their PBM statement. Get it? Pretty simple and lots of fun. EDITED TO ADD: There have been so many comments that we have moved on to the second comment page - please click "Newest" down at the bottom of the comment thread to take you to the most recent comment. Otherwise everyone will be replying to the dog person comment. And believe me, that gets hilarious but non-sequiturish. Example: "The PBM loves Real Housewives." "False. 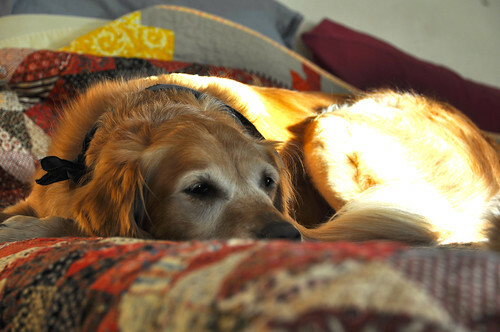 I can't stand the hair, slobber or smell." 1. Only one chance per person. 2. No need to follow me or do any other social networking. 4. Comments that don't follow the format described above (e.g., merely say "thanks, pick me") will be removed - not because I am a cranky, power-mad witch but because the entry system is interactive and depends on everyone following the rules. 5. Comments will close at 5pm PST on Friday, December 16 and the winner will be notified by email. 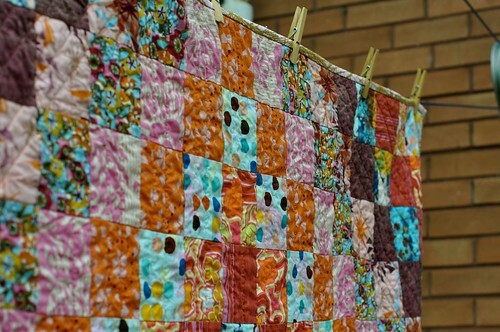 Don't forget to go to Sew Mama Sew to find the list of all the other participating blogs. Have fun and good luck! 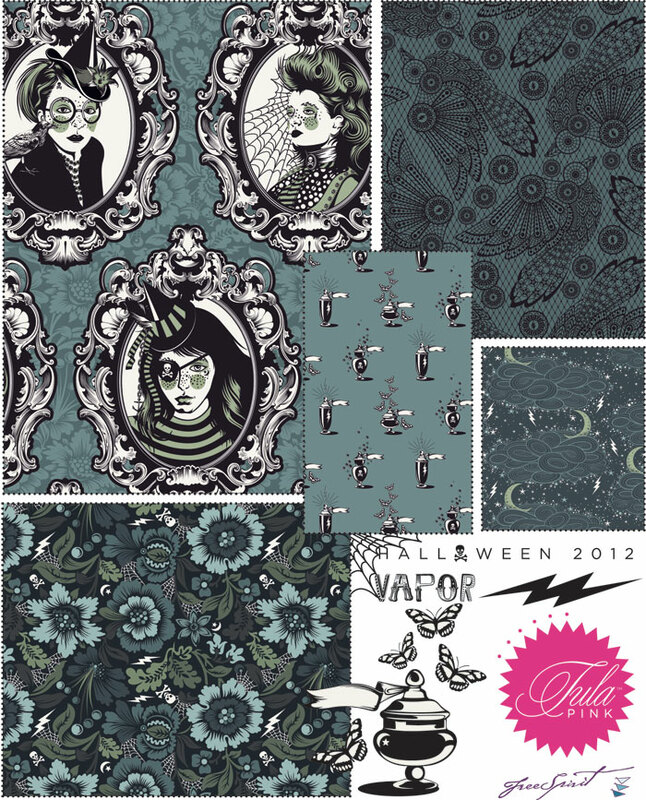 I have been enjoying looking at all the posts that people have been sharing with photos of all the new fabric coming out. 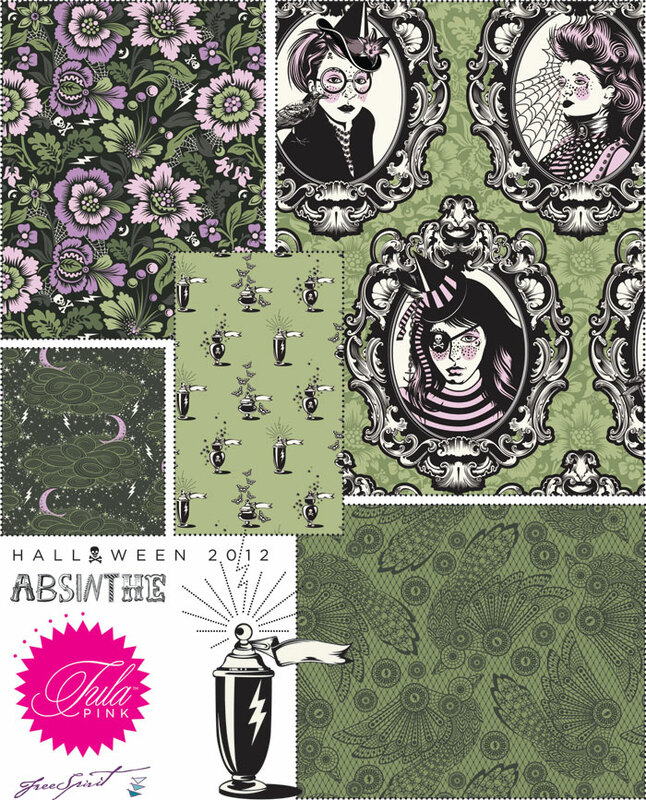 I am trying to be dispassionate about all that eye candy, but I must share with you one collection that is getting a lot of hype. I must admit I love it, too. 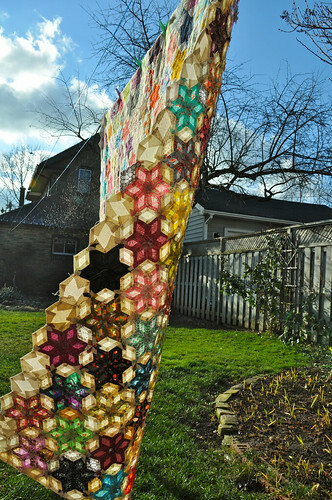 It's Curious Nature, by Amy Butler's husband. 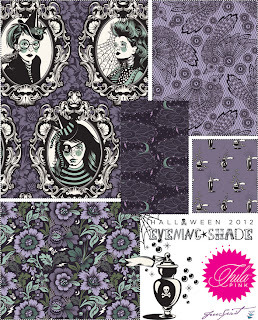 And I can't wait to pair it with this other upcoming line: Nightshade by Tula Pink. 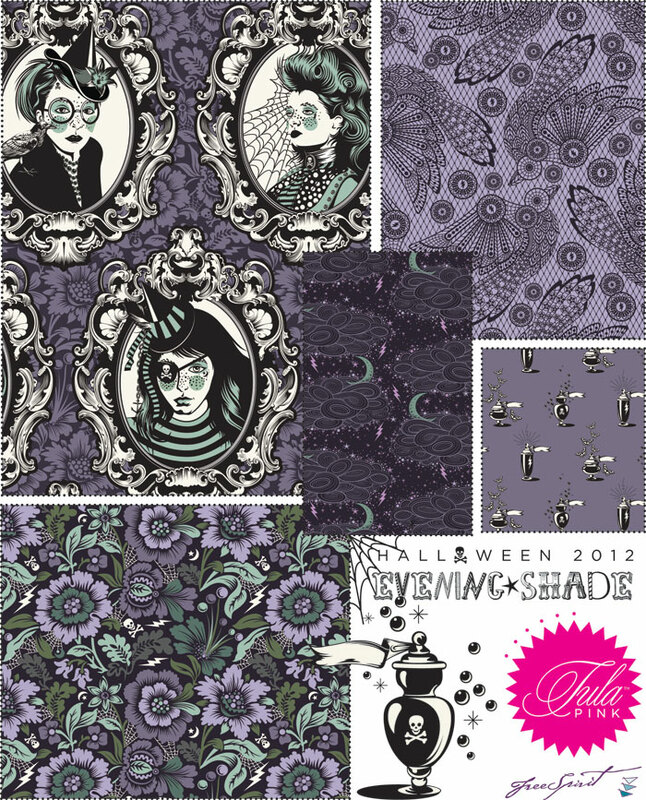 I'll have quite a wait, since Nightshade isn't coming out until Halloween 2012. Never mind, it will give me time to save up. I hope you do have your passport, because the Trip Around the World is finished at last! Here she is in all her splendour! 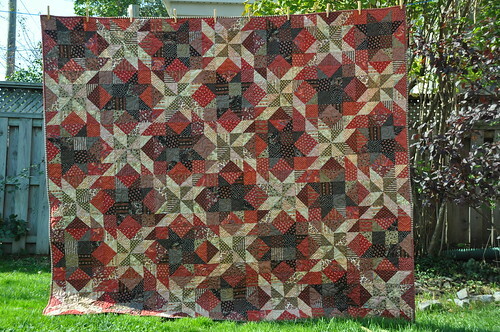 It finishes at 60" x 72", batted with cotton, machine pieced and quilted. 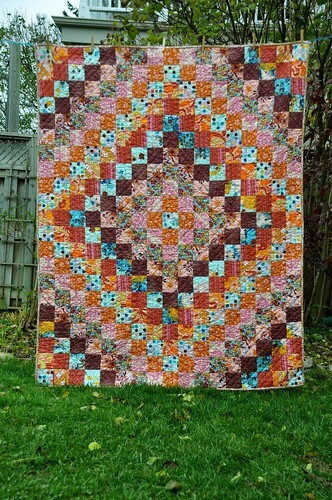 I used Bonnie Hunter's tutorial, and I recommend it if you are looking for a quick and easy quilt that adds up to more than the sum of its parts. And what about the back? 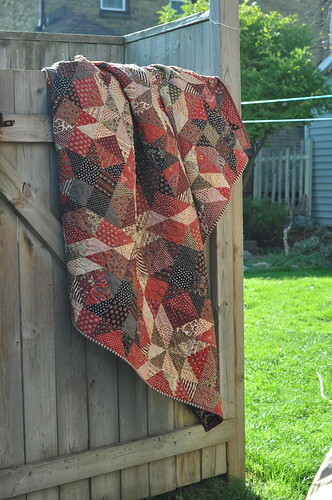 I have a few big-yardage pieces down in the basement that I have bought on sale at various times that I keep for backs, and I was hoping that one of them would fit the bill for this quilt. 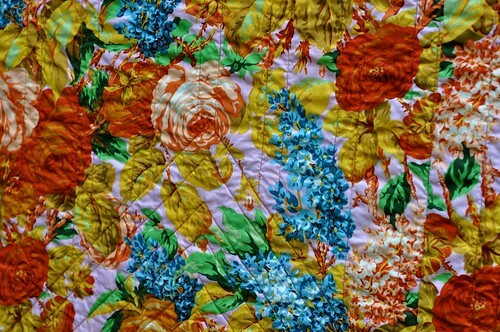 There was one in particular that I was thinking of, a Kaffe Fassett print with birds (the recipient of this one is a big time bird lover and has several birds in her home). It would have done well enough, but when I pulled this one out, I realized that it was the only choice. Doesn't it match the top well? 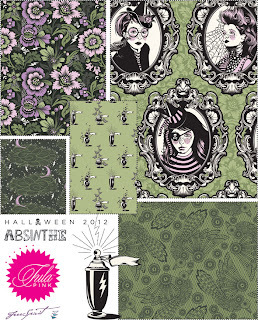 It even looks like I could have used it as the inspiration fabric for the rest of the initial fabric choices! 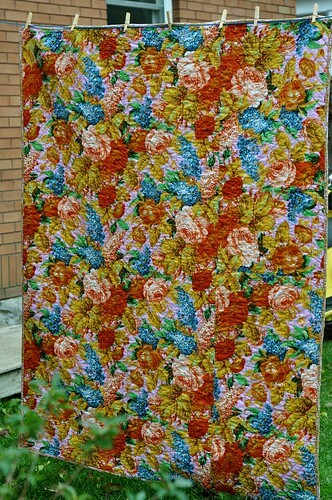 But I had not even remembered that I had that fabric until I opened up my bin of backs. The binding is some Habitat; a few pieces from that line are in the top, as well. 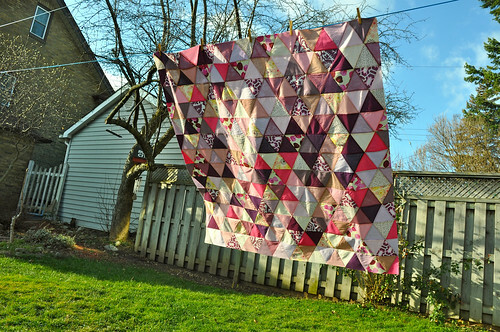 In my last post, I showed you my plan for straight and diagonal line quilting. It went well! 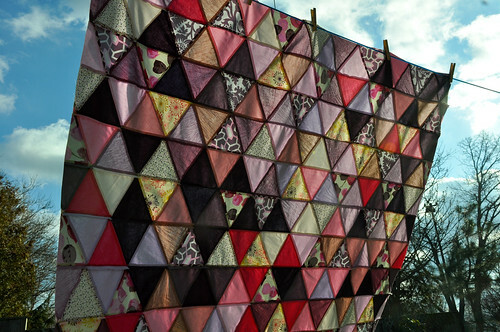 The quilting is a combination of vertical and diagonal lines. 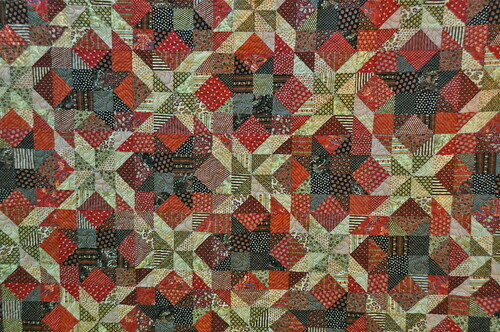 Diagonal lines that trace the diamond shape in the centre and at the corners, and vertical lines that fill in the rest of the quilt. 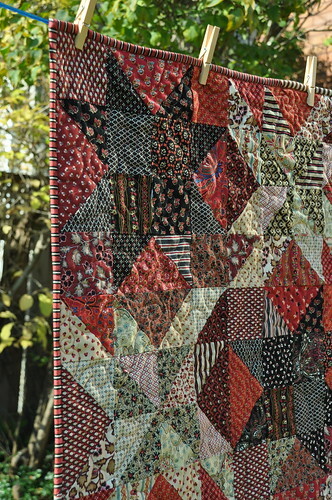 Here you can see how the vertical and diagonal lines meet near the centre of the quilt. You can almost see it better on the back - here is the same view on the reverse. 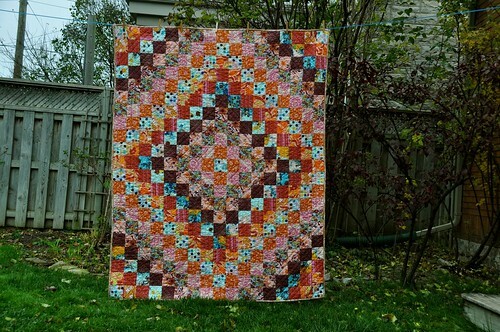 I feel like the straight line quilting (my first time ever) went fine. Several commenters advised the use of a walking foot. My Pfaff has an integrated walking foot which is very handy and I'm glad it does. The lines were easily spaced with hardly any puckers. 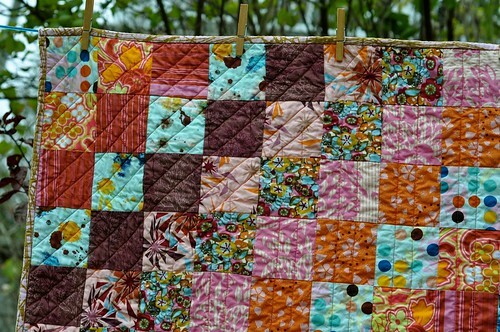 In the photo below the lines look wavy, but this is just the clothes pins as they hold the quilt up, pulling against its own weight. I used a new foot that I picked up at the fall sale at my LQS. As you know, feet for the sewing machine tend to be expensive but I got this at half price. It's a stitch-in-the-ditch foot for my Pfaff. Here is a photo of it. I'm not sure if you can see it very well; it has a little metal guide that sticks out of the presser foot just at the centre, just where the needle will hit. 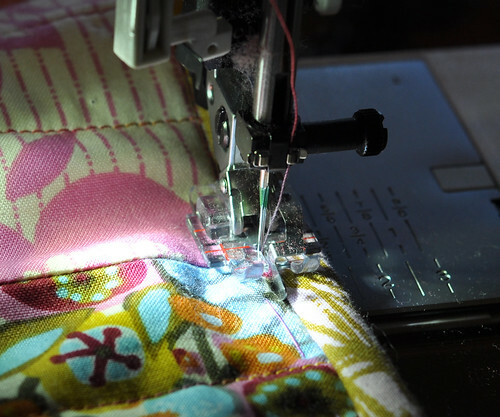 In this photo, I am using it to stitch down my binding, you can see that it's lined up just at the ditch where the binding has been stitched onto the the quilt top and folded over. It's a great little gadget. I don't do a lot of in-the-ditch quilting, except for sewing my bindings on by machine, and this has been just terrific for that purpose. It increases accuracy and speed since it gives you an unobstructed view of where the needle is going to hit. 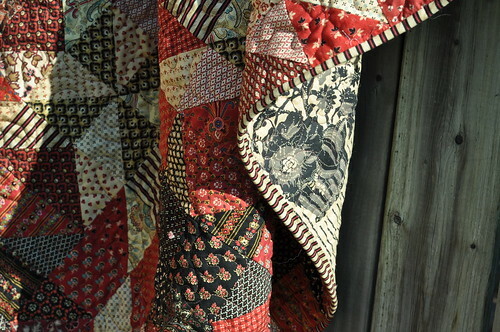 For that reason, it also worked great for sewing along the painter's tape that I used to mark the quilting lines. I feel that I definitely got my money's worth out of that impulse buy! 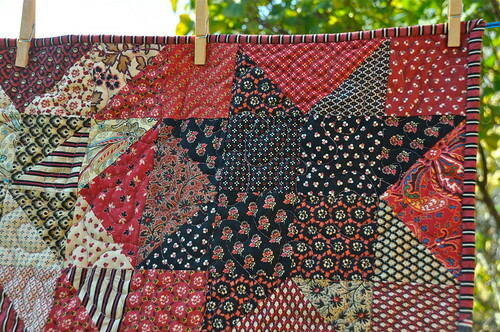 This quilt is destined for a friend in the LA-area who has been through the mill over the last 18 months. I'm taking it out there in about a week - it's a surprise and I hope she likes it. Oh! 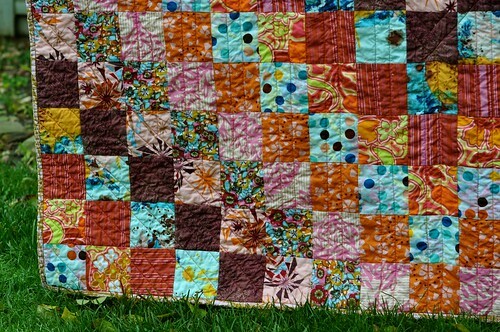 Anybody know any good quilt shops in Orange County??? Do sing out, if so! Julie, who admits that she is old enough to have played with Barbie Fashion Plates, and claimed that the person below her liked fried pickles. You win the French General charm packs, Julie! 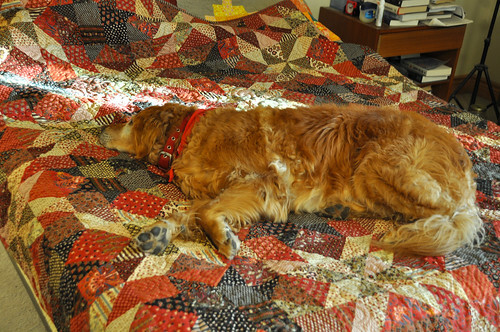 Manda, who says that she does not like vintage sheets, and thought the person below her spent too much time blog surfing and not enough time sewing. 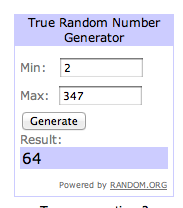 Manda, you win the Clermont Farms charm packs! Rachel, who can play a musical instrument, and accused the person below her of dressing her dog up for Halloween. Rachel, I hope you like Habitat, because I have five half-metres for you. And because I like surprises, a fourth, mystery giveaway will go to Tusen, who was not going trick or treating, and suspected that the person below her had green eyes and freckles. Ladies, I'll be emailing you for your mailing addresses. I hope everybody enjoyed the Person Below Me comment thread! I had a great time reading them all! 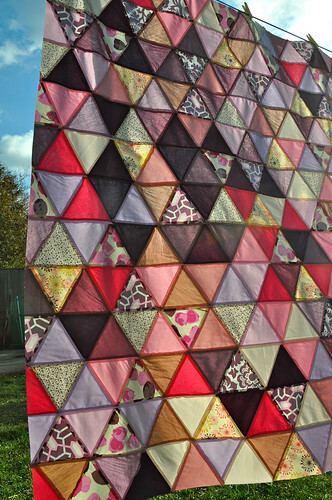 I'll close with some more quilty photos. Photo, originally uploaded by Shadrach Meshach & Abednego. 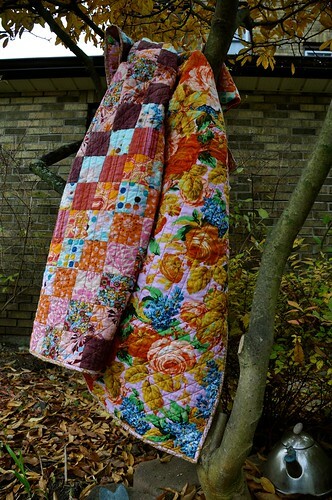 I'm going to LA in two weeks and I'm going to be bringing this quilt to my friend, who has suffered all kinds of personal setbacks over the last 18 months. 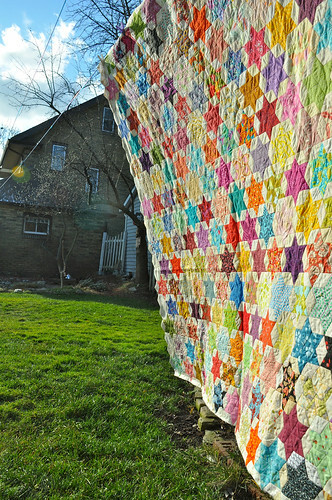 I feel like there's nothing better than a quilt to stand as a reminder that you are loved, especially when the people whom you care about are so far away. 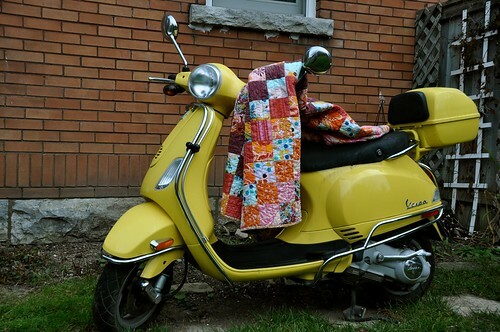 So you've seen photos of the Trip Around the World quilt top, and now I'm getting ready to quilt it up. 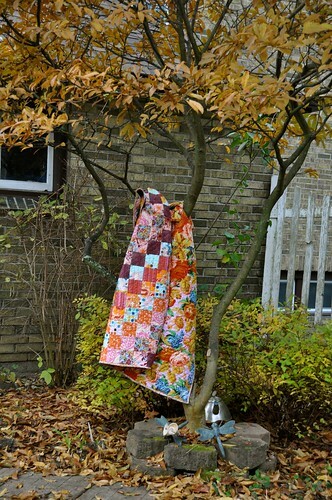 I'm trying something new in the quilting department! I've mostly done FMQ swirls or meanders or flowers, but this time I thought I would give straight lines a try. 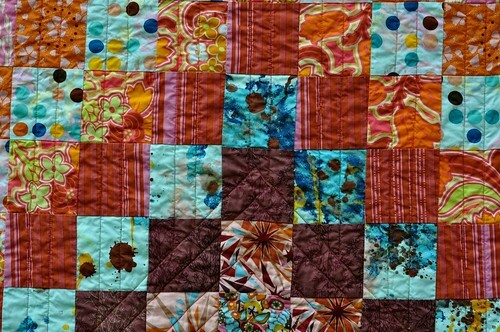 When I pin-basted it this afternoon I used low-tack painters' tape to mark some quilting lines. 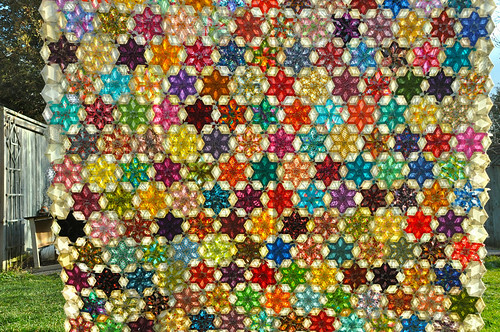 The tape is about one or one and a half inches across, and my plan is to quilt along each side of the tape that is currently stuck on there. 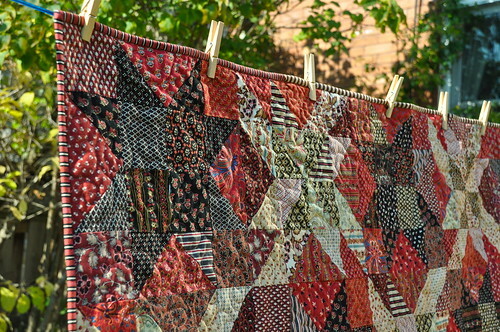 Then I'll shift the tape over to the next row of blocks and repeat the process, so that there is quilting through each line of squares, either on the diagonal or straight. 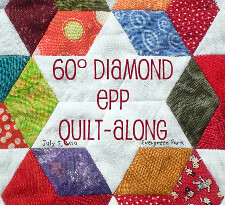 I am excited to try this - I think the quilting in different directions will give some extra interest to the final product. Wish me luck!